The article describes the “Vienna E-Lecturing” (VEL), a complex internet-based blended-learning setting developed for students at the University of Vienna (Austria). As part of the introduction to research methods in psychology, VEL aids in imparting factual knowledge regarding research methods and evaluation, as well as promotes learning skills, collaborative learning, and e-competence. The program's conceptualization is based on instructional, as well as motivational findings yielding the program's main teaching principles. The course is composed of online learning modules and face-to-face units (including tutorials and self-regulation training). Within a cooperative learning setting, the modules, which are available through a learning platform, systematically instruct students to learn more effectively by completing different tasks. Following a brief overview of the e-learning boom within higher education the program's background, its goals, components, and didactic principles will be described, the online modules will be briefly outlined and ultimately, the evaluation of VEL will be addressed. Schober, B., Wagner, P., Reimann, R. & Spiel, C. (2008). Vienna E-Lecturing (VEL): Learning How to Learn Self-Regulated in an Internet-Based Blended Learning Setting. International Journal on E-Learning, 7 (4), 703-723. Waynesville, NC USA: Association for the Advancement of Computing in Education (AACE). Retrieved April 18, 2019 from https://www.learntechlib.org/primary/p/24292/. Alonso, F., López, G., Manrique, D., & Viñes, J. (2005). An instructional model for web-based e-learning education with a blended learning process approach. British Journal of Educational Technology, 36, 217-235. Astleitner, H., & Baumgartner, A. (2000). Dropout bei web-basiertem fernunterricht [Dropout in web-based distance learning]. In R. Kammerl, & H. Astleitner (Eds. ), Computerunterstütztes lernen [Computer-based learning] (pp. 130-147). München, Germany: Oldenburg. Azevedo, R., & Cromley, J.G. (2004). Does training of selfregulated learning facilitate student’s learning with hypermedia? Journal of Educational Psychology, 96, 523-535. Boekaerts, M. (1999). Self-regulated learning: Where we are today. International Journal of Educational Research, 31, 445-475. Boekaerts, M. (2002). Bringing about change in the classroom: Strengths and weaknesses of the self-regulated learning approach – EARLI Presidential Address, 2001. Learning and Instruction, 12, 589-604. Breen, R., Lindsay, R., Jenkins, A., & Smith, P. (2001). The role of information and communication technologies in a university learning environment. Studies in Higher Education, 26, 95-114. Bruns, B., & Gajewski, P. (2002). Multimediales lernen im netz. [Multimedia learning in the net.]. Berlin: Springer. Conole, G., & Fill, K. (2005). A learning design toolkit to create pedagogically effective learning activities. Journal of Interactive Media in Education 2005(08). Dabbagh, N., & Kitsantas, A. (2004). Supporting self-regulation in student-centered web-based learning environments. International Journal on E-Learning, 3, 40-47. Deci, E.L., & Ryan, R.M. Diehl, J. M. (1993). Statistik-ausbildung im psychologie-grundstudium [Statistics in undergraduate psychology education]. In G. Krampen & H. Zayer (Eds. ), Psychologische aus-, fort- und weiterbildung in den alten und neuen Ländern [Psychological training and inservice training in the old and new German states] (pp. 18-29). Bonn, Germany: Dt. Psychologen-Verlag. Dolinski, B. (2001). An active learning approach to teaching statistics. Teaching of Psychology, 28, 55-56. Dresel, M. (2004). Motivationsförderung im schulischen kontext [Motivation promotion in school contexts]. Göttingen, Germany: Hogrefe. Fink, A. (1995). Evaluation for education & Psychology. Thousands Oaks, CA: Sage. Fischer, F., & Mandl, H. (2002). Lehren und lernen mit neuen medien [Teaching and learning using new media]. In R. Tippelt (Ed. ), Handbuch bildungsforschung [Handbook of educational research] (pp. 623-637). Opladen, Germany: Leske+Budrich. Gagné, R. M. (1985). The conditions of learning and theory of instruction. New York: Holt, Rinehart, & Winston. Gal, I., & Ginsburg, L. (1994). The role of beliefs and attitudes in learning statistics: Towards an assessment framework. Journal of Statistics Education, 2, 1-54. Garrison, D., & Kanuka, H. (2004). Blended learning: Uncovering its transformative potential in higher education. The Internet and Higher Education, 7, 95-105. Heiß, A., Eckhardt, A., & Schnotz, W. (2003). Selbst- und fremdsteuerung beim lernen mit hypermedien [Self- and external direction at learning with hypermedia]. Zeitschrift für Pädagogische Psychologie, 17, 211-220. Keegan, D. (1986). The foundation of distance education. London: Croom Helm. Keeton, M. T. (2004). Best online instructional practices: Report of phase I of an ongoing study. Journal of Asynchronous Learning Networks, 8, 75-100. Kerr, M., Rynearson, K., & Kerr, M. (2006). Student characteristics for online learning success. Internet and Higher Education, 9, 91-105. Kerres, M. (2001). Multimediale und telemediale lernumgebungen [Multimedia and telemedia learning environments]. München, Germany: Oldenburg. Kickul, G., & Kickul, J. (2006). Closing the gap: Impact of student proactivity and learning goal orientation on e-learning outcomes. 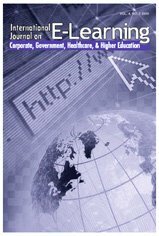 International Journal on E-Learning, 5, 361-372. Klauer, K. J. (1985). Framework for a theory of teaching. Teaching and Teacher Education, 1, 5-17. Kokavecz, I., Lammers, F., & Holling, H. (1999). Evaluation von computerunterstützten lern- und lehrprojekten [Evaluation of computer-based learning and teaching projects]. In H. Holling & G. Gediga (Eds. ), Evaluationsforschung [Evaluation research] (pp. 59-72). Göttingen, Germany: Hogrefe. McCombs, B., & Vakili, D. (2005). A learner-centered framework for e-Learning. Teachers College Record, 107, 1582-1600. Moore, M. G., & Kearsley, G. (1996). Distance education. A systems view. Belmont, CA: Wadsworth. Nachmias, R., Mioduser, D., Oren, A., & Ram, J. (2000). Web-supported emergent-collaboration in higher education courses. Educational Technology & Society, 3, 94-104. Onwuegbuzie, A. J. (2004). Academic procrastination and statistics anxiety. Assessment and Evaluation in Higher Education, 29, 3-19. Owston, R. D. (2000). Evaluating web-based learning environments: Strategies and insights. CyberPsychology and Behavior, 3, 79-87. Reinmann-Rothmeier, G., & Mandl, H. (2001). Unterrichten und lernumgebungen gestalten [To create lessons and learning environments]. In A. Krapp & B. Weidenmann (Eds. ), Pädagogische psychologie [Educational psychology] (pp. 603-646). München, Germany: Beltz/PVU. Reinmann-Rothmeier, G.
Reisetter, M., LaPointe, L., & Korcuska, J. (2007). The impact of altered realties: Implications of online delivery for learners’ interactions, expectations, and learning skills. International Journal on E-Learning, 6, 55-80. Renkl, A. (1996). Träges wissen: Wenn erlerntes nicht genutzt wird [Inert knowledge: When what is learned is not used]. Psychologische Rundschau, 47, 78-92. Renkl, A., Gruber, H., & Mandl, A. (1996). Kooperatives problemorientiertes lernen in der hochschule [Cooperative learning in higher education]. In J. Lompscher & H. Mandl (Eds. ), Lehr- und lernprobleme im studium [Teaching and learning problems in higher education] (pp. 131-147). Bern, Germany: Huber. Scanlon, E., & Issroff, K. (2005). Activity theory and higher education: Evaluation learning technologies. Journal for Computer Assisted Learning, 21, 430-439. Schmitz, B. (2001). Self-monitoring zur unterstützung des transfers einer schulung in selbstregulation für studierende [Self-monitoring as promotion of the transfer of a training in selfregulation for students]. Zeitschrift für Pädagogische Psychologie, 15, 181-197. Schroeder, U., & Spannagel, C. (2006). Supporting the active learning process. International Journal on E-Learning, 5, 245-264. Schutz, P.A., Drogosz, L.M., White, V.E., & Distefano, C. (1998). Prior knowledge, attitude, and strategy use in an introduction to statistics course. Learning & Individual Differences, 10, 291-308. Simpson, M.L., Hynd, C.R., Nist, S.L., & Burrell, K.I. (1997). College academic assistance programs and practices. Educational Psychology Review, 9, 39-87. Sims, R., Dobbs, G., & Hand, T. (2002). Enhancing quality in online learning: Scaffolding planning and design through proactive evaluation. Open and Distance Learning Association of Australia, 23, 135-148. Stipek, D. (2002). Motivation to learn (4th ed.). Boston: Allyn & Bacon. Stokes, S. (2000). Preparing students to take online interactive courses. The Internet and Higher Education, 2, 161-169. Vaughan, N. (2007). Perspectives on blended learning in higher education. International Journal on E-Learning, 6, 81-94. Weibel, P. (2003). Lernlabor gesellschaft. Vom wissenswandel durch medienwandel [Learning lab society. About the change of knowledge by the change of media]. In R. Keil-Slawik & M. Kerres (Eds. ), Wirkungen und wirksamkeit neuer medien in der bildung [Effects and effectivity of new media in education] (pp. 45-59). Münster, Germany: Waxmann. Zeidner, M. (1991). Statistics and mathematics anxiety in social science students: Some interesting parallels. British Journal of Educational Psychology, 61, 319-328. Ziegler, A., & Schober, B. (1997). Reattributionstrainings [Attributional retraining]. Regensburg, Germany: Roderer. Zimmerman, B.J. In M.